The SBC6300X Single Board Computer from Embest is based on an Atmel AT91SAM9263 MCU with 32-bit ARM instruction set and complete embedded software environment. It has a flexible design with a tiny controller board Mini6300 mounted directly on an expansion board through two 0.8mm 100pin Free Height (FH) surface-mount connectors. The CPU board of SBC6300X has the ARM9 processor and memory on board. The expansion board has extended features of AT91SAM9263 and offers various hardware interfaces including 8 UARTs, 2 Ethernet ports, USB Host and Device, CAN, TWI, LCD, Touch Screen, Keyboard, SD card, Jtag, Audio and etc. 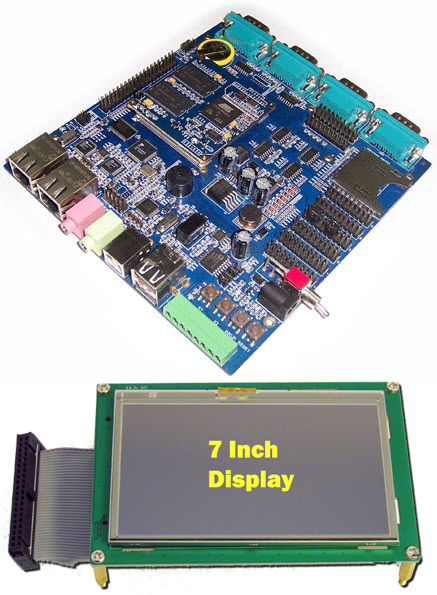 Embest offers Windows CE 6.0 BSP and Linux 2.6.24 BSP for this board. Users can develop with Microsoft eVC or linux tool chain, which can get your products to market quickly. The rich industrial bus interface resources of this sing board computer makes it ideal for embedded applications requiring wide operating temperature ranges, and flexible I/O connectivity. It can be used in many application fields, such as medical equipment, industrial field control, smart instrumentation, industrial control devices, monitoring, automotive electronics and other fields.